I took this photo last fall before the heavy snow covered all of the grass. 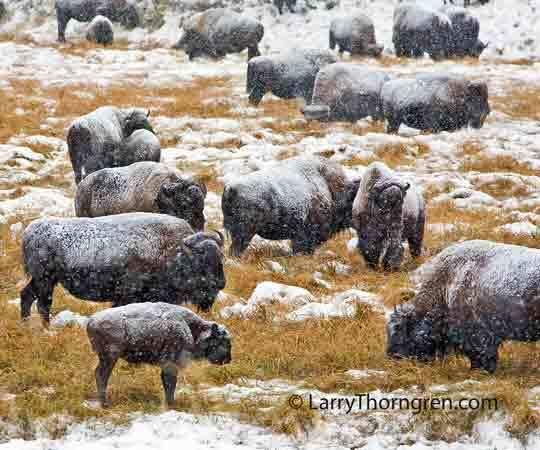 These Bison are finding it difficult to find food this year due to a cold winter with lots of deep snow. They are trying to migrate out of the park near Gardiner, Montana in their search for grass. This is causing lots of problems for Yellowstone and private ranchers at lower elevations downstream from Gardiner where the Bison want to go. There are several solutions being offered: Ship them to Slaughter, Shoot Them in The Park, Let Them Starve To Death, or Feed Them Hay. The Governor of Montana has just issued a order that prohibits shipping them through Montana to be slaughtered, so that leaves just three solutions left for this year. There are over 500 Bison trying to get out of Yellowstone at this time. There may be as many as 1000 in a few more days. There are 4,000 Bison in Yellowstone, which is more than than the winter range will support on snowy winters like the present one.